The Power of Planting a Seed. While exploring what we would like to accomplish in 2013 the City Rising Farm team took the opportunity to look back to see what happened to the tiny seeds we had sown back in 2009. Sometimes we get so busy in “doing” that we forget to “reflect” on what has been done. We have sown many seeds over the short life of CRF. Some took root right away and blossomed into bountiful crops. 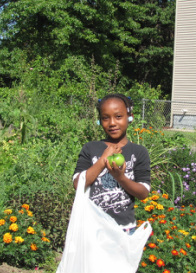 Those crops include the relationships built in the Hough neighborhood we serve in. We’ve worked side by side with many residents and community partners; the youth from all over the neighborhood and beyond, our wonderful students at Daniel Morgan Middle School and the Citizens Leadership Academy, the Thurgood Marshall Recreation Center and the Hough Library. Our work at the Hough Branch library turned into an opportunity to build a relationship with the South Branch Library and the people of that neighborhood. However we have been buoyed like a newly germinated seed in a bed of fresh loam by the many supporters that came our way to help with donations of time, resources, good thoughts and funding. We are thankful to everyone for their support! 2013 will bring new and exciting opportunities to tend to our relationships/crops so that our fields continue to be healthy, vibrant, and productive. It also brings the opportunity for us to explore and create other relationships so that our crops are also diverse! One of the most important things we have learned is to collaborate or cross pollinate (open air of course lol) with other people and organizations that bring the spirit of community and inclusion to their efforts. Since one of the core strengths of the City Rising Farm team is our diversity we feel fortunate that we have been able to garner support in many circles. We are excited about working with some new organizations, including Food Not Lawns, Cleveland, Asian Services in Action, Inc., and Cleveland UMADAOP. It is our hope that in 2013 we can add more new crops to our field. So if you are a person, group, or organization that is looking to cross pollinate please feel free to contact us at City Rising Farm. We are always looking for a good companion plant! 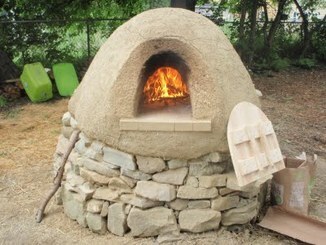 City Rising Farm Goes Indiegogo Redux! New Fiscal Agent, New Campaign, Same Commitment to the Mission! 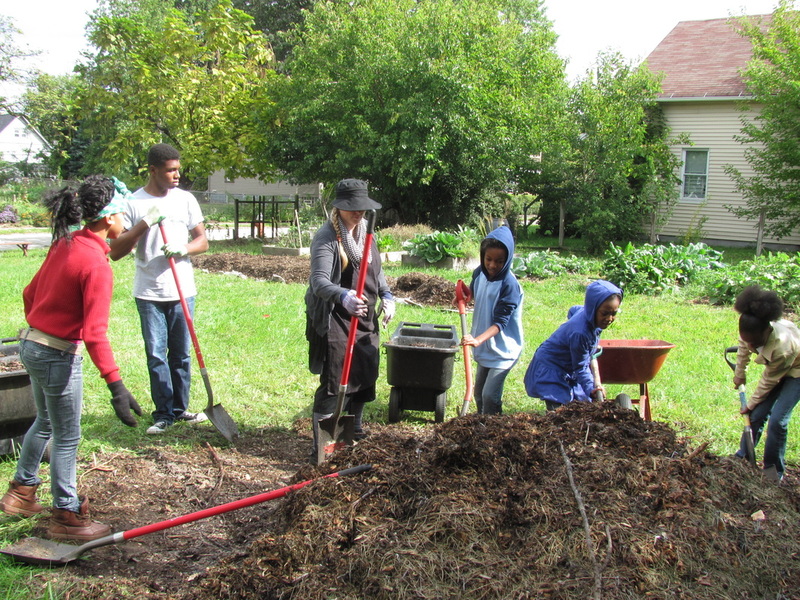 As we move forward with programming in urban agriculture education we continue to look for ways to keep the services and activities we provide accessible to everyone. We are pleased to have worked with the St. Clair/Superior Development Corporation and thank them for their service to the beginning of City Rising Farm. Moving forward Burten, Bell, Carr Development, Inc. will serve as our fiscal agent and we look forward to the continued success of City Rising Farm. The new Indiegogo campaign is a flexible campaign in which donations are tax deductible to the extent allowed by law. This will also allow us to retain the funds donated should we fall short of the stated goal. The appeal on Indie GoGo will help us raise funding to keep the mission going and the vision growing. 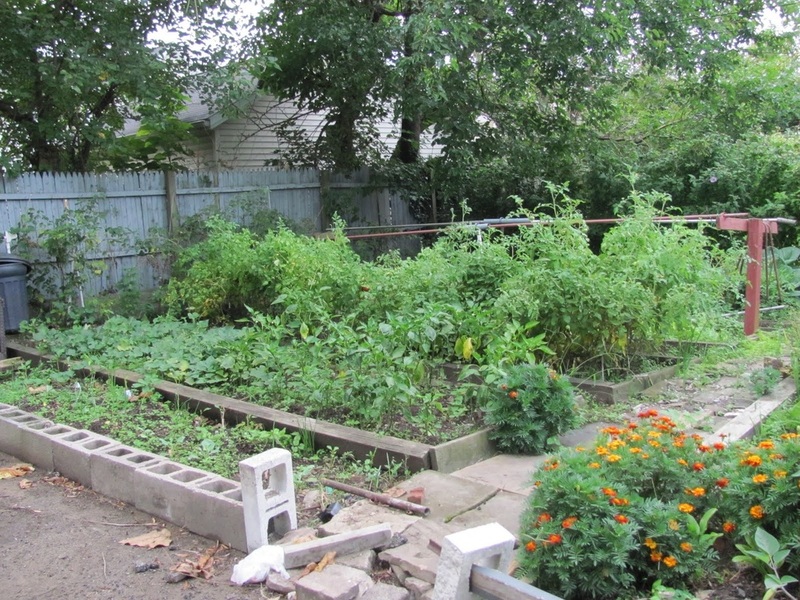 Please consider supporting City Rising Farm through a donation to this campaign. The link is listed below. Your donation keeps the smiles glowing and good fresh food growing!! 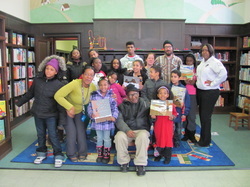 City Rising Farm has been fortunate to have some fantastic youth in our midst. Our latest are teens Zaid and Teiarra. 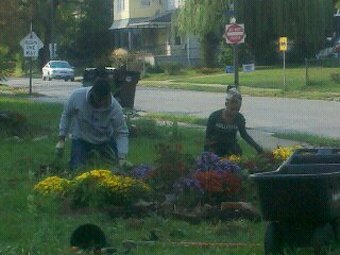 They worked with us this fall and are heading up the market garden youth project. The neighbors adjacent to the market garden remarked at how wonderful it was to look out their windows and see the beautiful flowers and were so pleased that the youth in the neighborhood were involved. Zaid has brought a wealth of knowledge from his summer job on a farm in Connecticut and Teiarra's bubbly personality and can do spirit makes her perfect for engaging other teens. 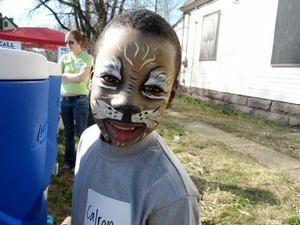 Look for our young people at farmers markets and other events. 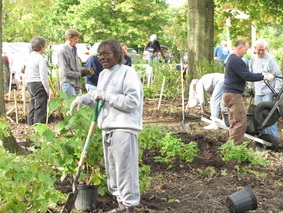 If you know any young people that would like to learn how to grow fresh food please feel free to have them contact us! Those words both frightened me and filled my heart with hope at the same time. That was my first meeting with Mrs. Elizabeth McGregor. My colleague and I were doing soil testing on Blaine Avenue in anticipation of starting a market garden on land that I was going to purchase. We decided to test all of the lots and started at the ones closest to Mrs. McGregor's house. We were on the second set of lots when this diminutive lady came across the street with a metal trowel in hand which she pointed directly at me and said, "Who are you and what are you doing?" I fumbled with my envelope of papers and stuttered as I tried to explain why we were here in her neighborhood with no invitation or notice. She informed me that we were spotted as soon as we came on the street, that we were being watched. I explained that we were doing soil testing to see if the lots would be safe for gardening. With that exchange began a wonderful friendship and gardening relationship that benefits so many in and outside of the Hough neighborhood. We were so happy to find someone who cared enough about her community to come out and find out why strangers were traipsing around her street even if the traipsing was in an empty lot. Mrs. McGregor was happy to have someone take a positive interest in those lots. From that point on she was a huge force in getting things off the ground. She gathered signatures in support of the garden and attended community meetings to to let others know how great this would be in the neighborhood. Mrs. McGregor so it happens is a gardener. (I guess the trowel gave that away! lol) In fact she has what many consider to be the premier garden in Hough! It is one not to be missed and most amazingly she does it all herself. "It was like being in the Garden of Eden and an Upcycle Paradise all at the same time!" On my first visit to her garden all I did was walk, observe in awe, and eat. It was like being in the Garden of Eden and an Upcycle Paradise all at the same time. 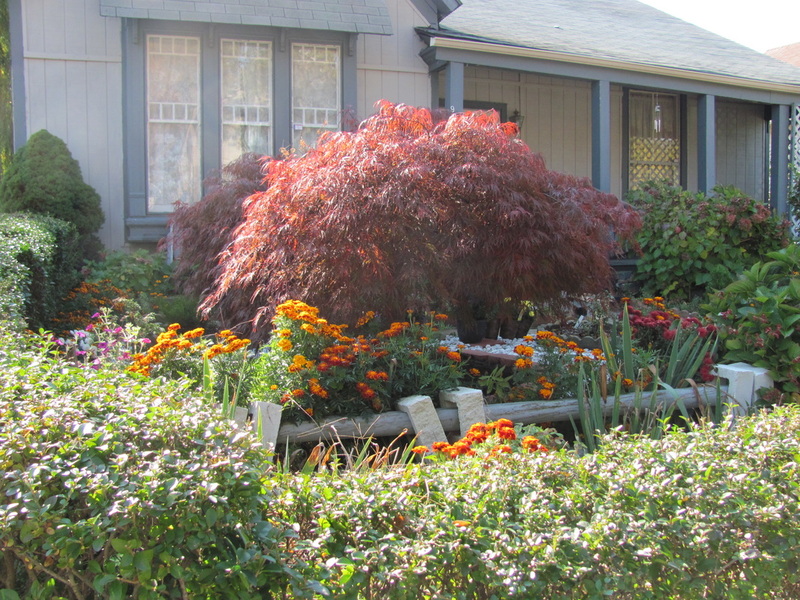 Planters from drain pipes, trellis from discarded TV antennas draped in weigela, an arbor made from all kinds of pipes with grapes galore. She never wastes anything. There is a project in every discard and the garden is always changing. You could visit twenty times and see something different each time. "Mrs. McGregor is our Garden Ambassador!" 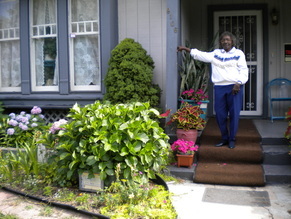 Mrs. McGregor is the City Rising Farm Gardener-At-Large, our program ambassador. You can find her at any number of events promoting what we do and assisting other groups on behalf of our organization. 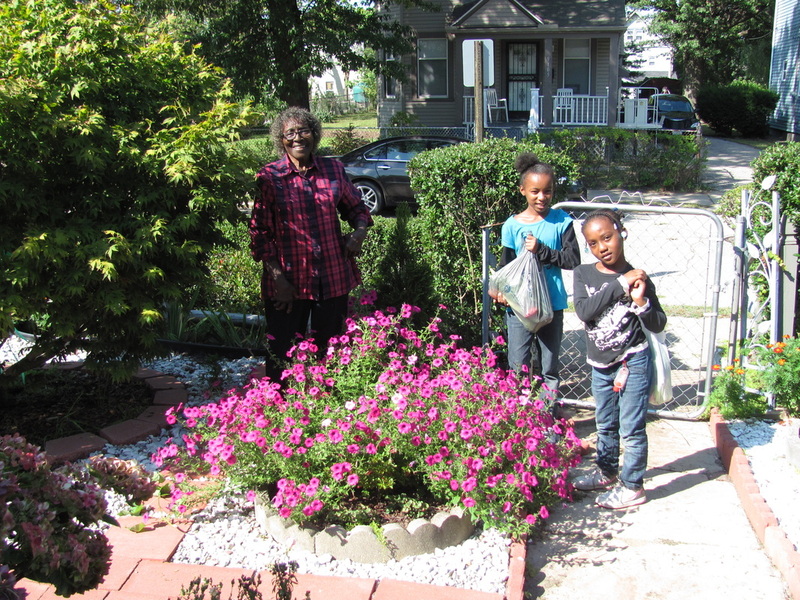 Her own garden is considered the neighborhood nursery because she has so many plants that she divides and gives them out regularly. You can always find people who visit leaving with plants. 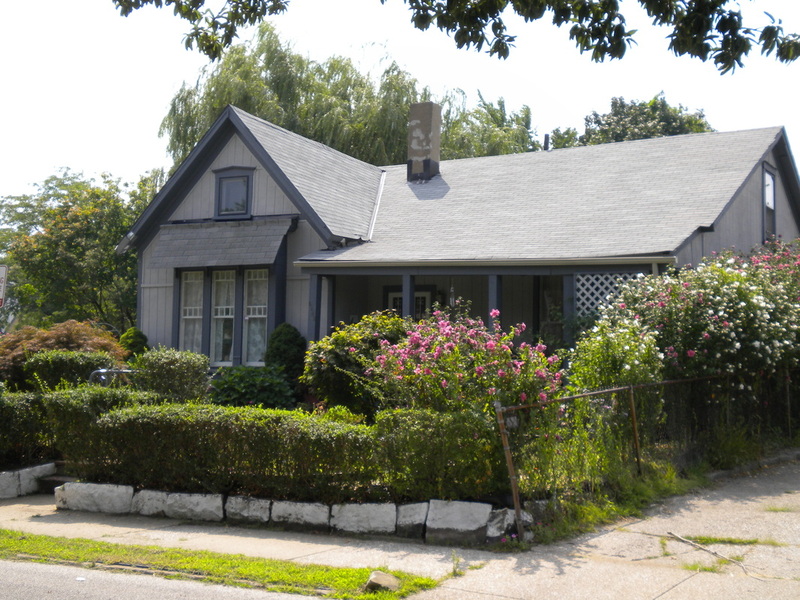 In fact many of the plants on Blaine Avenue come from Mrs. McGregor's garden. She is also our go to person for wise advise, and most importantly our wonderful friend! 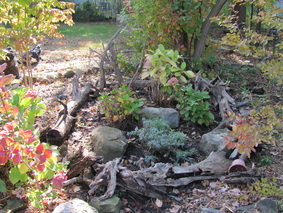 Listed below are some photos of Mrs; McGregor's garden and a link to the rest. Please enjoy! In a hurry? Here's the direct link to all of our photos! Join us in this hands on seed starting workshop! Lots of seeds, soil and fun! Homemade soup, salad and healthy snacks will emerge here as well. Re-potting plants was the order of the day. We had to move our plant starts into bigger pots so they can continue growing while we wait for outdoor planting! We had delicious noodle soup and salad! 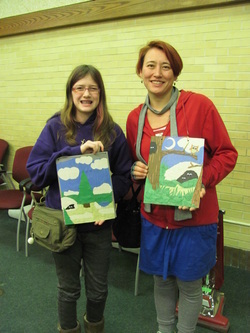 Creating art from seeds and forcing bulbs made for lots of fun at the Hough Souper Saturday. We had delicious homemade tomato soup, brown rice, salad and wonderful garlic bread! Is our mouth watering? Well don't miss the next Souper Saturday! 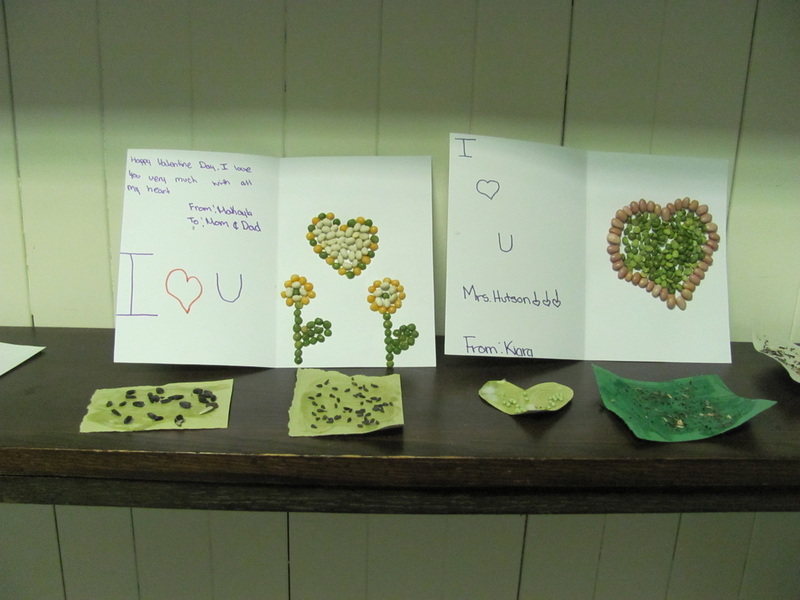 Creating Valentine cards with seeds and making seed paper as a special surprise for those special Valentines was the order of the day. We also had an incredible homemade chili and brown rice that hit the right spot on this snowy day. That and salad with fresh strawberries made for a great day! Check out the pictures at the link below. Lots of laughs and great conversation as we learned about hibernation and the animals right here is Ohio that hibernate. We also had homemade tomato soup and homemade vegetable stew with yellow rice and a salad with lettuce, cucumbers and apples. One of the library patrons donated crackers to go with the soup. We also had the pleasure of having one of our sponsors, Katherine Geralds come out to help and she brought great tasting rolls to add to the meal as well. Thanks so much to Katherine Geralds, Dan and Diane Roketenetz, and Melanie Craft for sponsoring this fun and educational event! 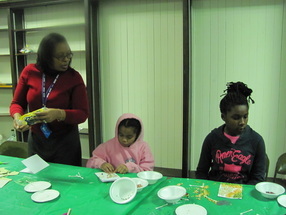 Everyone had tons of fun at the Hough January Souper Saturday. We created collages depicting the animals that hibernate, had a vegetable soup made with beans from the Blaine Avenue Community Garden and a delicious salad with apples and cucumbers. Our many thanks to Katherine Geralds, Dan and Diane Roketenetz, and Melanie Craft for sponsoring this fun and educational event! Please enjoy the video below created by Jeanne Ryan of Chicago on her November visit. Wwoofing works! !